Known as the 'boy from Santpedor', after coming up through the youth teams at FC Barcelona, he made his first team debut in the 1990/91 season. His brilliant playing career coincided with one of the most glorious times in the Club's history, the age of the 'Dream Team' presided over by coach Johan Cruyff who said that Guardiola was an extension of himself out on the field. 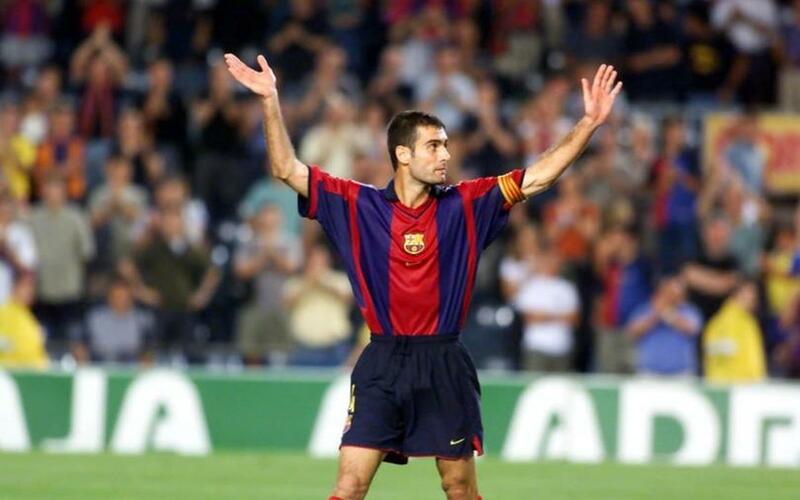 Pep playing in the same XI in the 1990s as some of the best players in the world: Romário, Laudrup, Bakero, Zubizarreta, Stòitxkov, Koeman, Sergi, Ferrer, Amor, Figo, Ronaldo, Rivaldo and Luis Enrique, amongst others. One bump in the road during his wonderful playing career was the serious injury he suffered in the 1997/98 season that kept him out for a year. He finally left Barça in 2001 to sign for Italian club Brescia. On the international stage his highlight was winning a goal medal with the Spanish national side in the 1992 Olympic Games in Barcelona. He became Barça B coach in 2007 and then first team coach in 2008, going on to be the most successful coach in the Club's history with 14 trophies in four seasons. winning six in 2009 alone. In 2010 was give the Gold Medal for Sporting Merit and in 2011 the Medal of Honour from the Catalan Parliament.